Ready for a great day of fun with the kids? 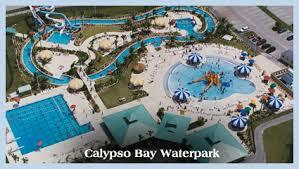 If you live out further west, Calypso Bay Water Park has everything you need to have lots of fun while cooling off. With a 897-foot river ride, two 4-story high twisty water slides, lazy river and swimming pool, children’s water playground, the kids will have a blast. Restrooms, playground, tables with umbrellas for shade and large parking lot available so come check it out! Locker rentals, locker rooms and shower facilities. Lap pool with diving boards and full service concession stand.